When I’m properly dressed for winter riding I look forward to riding my horses. Having bad winter riding gear can really reduce enthusiasm. It wasn’t too long ago when choices for winter horseback riding gear was really slim. When I was young rider, it was jeans and full leather chaps, duck boots with heavy socks, sweaters with a down vest and a warm knit hat. Helmets only got pulled out for jumping. Fortunately, the winter riding gear today is much better and there are many choices, not just one or none. I wear a merino wool base layer, or tights, under my riding pants. The breeches I prefer for winter are a soft-shell type that have a thin fleece lining on the skin side. This combination keeps you warm but not bulky against the horse. For my top I prefer a thin fleece, or a Merino wool sweater, with a snug fitting vest. 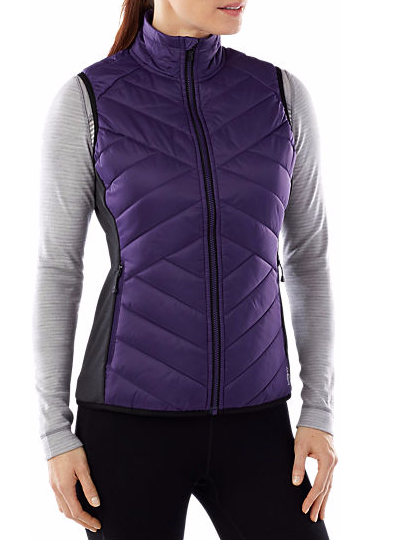 I still like a thin down vest or a SmartLoft vest is even better. Often I will wear an over coat, such as a GoreTex shell, or something like this that is a bit longer. The best over coat has the “hunter” coat fit that accommodates the cantle of the saddle. A good over coat should fit nicely, not too bulky, zip up around the neck and may or may not have a hood. If you ride inside, the over coat just goes as far as warming up a few times around the ring before being taken off. At which point, your base layers, and vest, need to be well fitted to allow for freedom of movement on your horse. It’s amazing how much heat the horse gives off and that heat is directly transmitted to the rider. You really don’t need to over-dress while on the horse. Bulky winter clothes are really not necessary and restrictive to ride in. Too much bulk in your dress will compromise how your arms move and fall next to your body. Bulky clothes will make you feel sloppy in the saddle and take away from the “feel” of your horse. Your riding gloves should follow suite. There are many types of riding gloves these days. It’s best to have a pair of thin insulated gloves with some leather or grip reinforcement in just the right places exclusively for winter riding. Try and keep this pair for riding and have another pair ready when you get off the horse. It’s too easy to turn your good riding gloves into barn gloves with out trying very hard. Barn gloves need to be heavier and warmer anyway. Returning to the head. Hopefully everybody wears their helmet when they are riding their horse these days. Helmets offer a certain amount of warmth, just by themselves. Although, simple additions can seal the brim gap or add that little extra touch to keep the heat in. Try a thin headband, these work perfectly for keeping the breeze out and warmth in. Beanies, which are a thin brimless knit hat, can be worn under the helmet and are thin enough that you don’t need a larger helmet for the additional fabric. In either case a thin headband or beanie can turn your helmet into a warm winter cap. If you are feeling discourage about riding your heart felt equine friend in the blistery winter months, check in with your riding gear. A few simple improvements will not only make you more comfortable but much more enthusiastic. Tally-Ho.